Those of us in skiing, mountain biking, base jumping, paragliding, and paddling communities sometimes refer to this place as Valhalla, the Viking word for Heaven. In the summer it never gets dark, and the geology of the fjords creates the most spectacular terrain in Northern Europe. 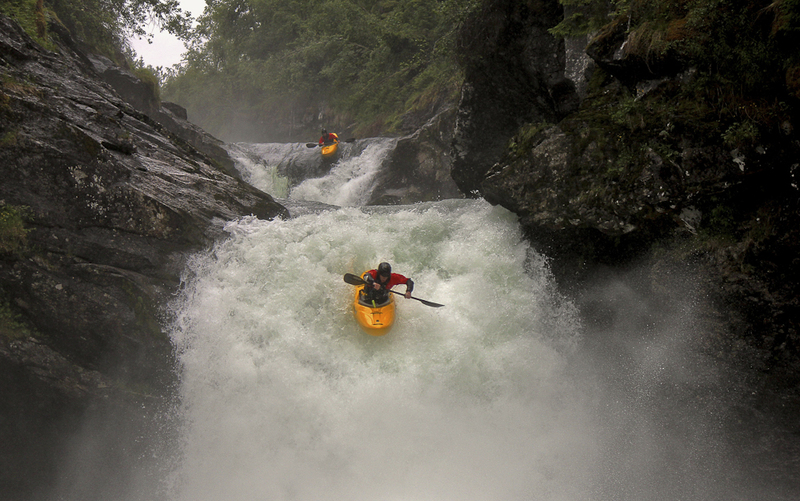 I was lucky enough to go on a mission this past June to explore Western Norway’s wildest and most beautiful rivers with my most trusted crew of paddlers. We weren’t sure what we’d find, due to Norway’s highly temperamental weather patterns, but what we did know is that there’s more water in this Scandinavian country than anywhere else in the world. The mere idea of a paddling trip to Norway brings on a lot of different emotions: fear, happiness, anxiety, pure stoke, to name a few. This emotional cocktail going into a serious trip always raises a lot of questions and ‘what ifs,’ but one thing was certain: Fjord Norway would present on one of the most challenging whitewater experiences of my life. Right on arrival to Scandinavia, our minds were blown wide open. We immediately found ourselves at the brink of what’s possible in our realm. A road trip though the fjords brought us to a seemingly endless supply of glacier-fed rivers, each offering waterfalls and unbelievably big rapids. We started our trip at the city of Voss for Extreme Week. Hundreds of the world’s most talented extreme athletes were gathered here, and we were in the thick of it. One of my favorite rivers on the planet, the Tiegdalselvi, is only a 30-minute drive outside of this quaint mountain town. The Tiegdalselvi is a committing steep creek that starts high in the mountains and gathers most of its water from rain-fed gutters cascading down thousands of feet from the peaks above. The place makes you feel as if you’re paddling through Tolkien’s Middle Earth. Before reaching the ocean, the Tiegdalselvi climaxes in a two-tiered 70ft drop. Sognefjord is the longest fjord in Norway and the second longest in the world. 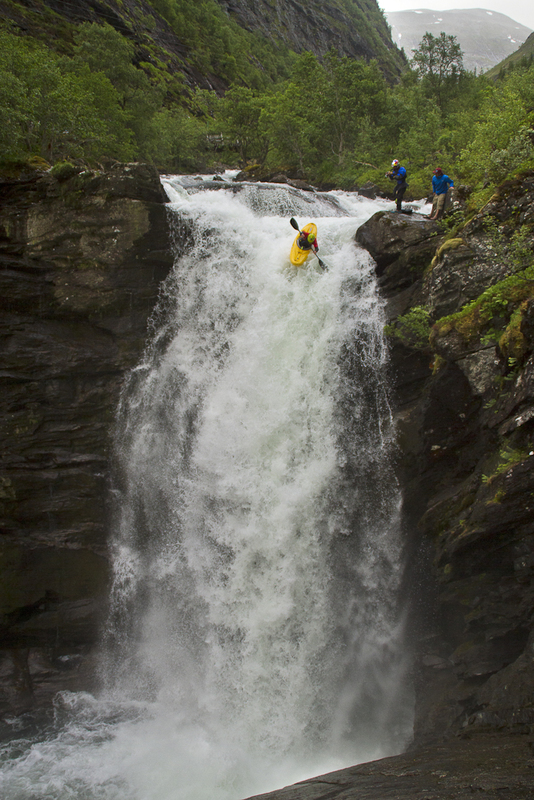 It’s also home to one of the most classic pieces of whitewater I’ve ever paddled. From a mountain lake to the ocean, the Sogndalselvi is 20km of full-on and very accessible kayaking. As if crafted by Odin himself, the Sogndalselvi has possibly the most picturesque set of waterfalls on Earth. Perfect green tongues of water fall off teacup-style drops back to back to back. In classic Fjord Norway style, as if it were a planned amusement park, you take out to right in the fjord, looking up at snow-capped mountains and the beautiful city of Sogndal. Valhalla. Driving north through some of the longest tunnels in the world (they literally go under mountain ranges), we found ourselves staring at an almost unrunnable-looking cascading falls in the middle of a traditional Norwegian village. Hellesyltfossen is the heart of the town of Hellesylt. For thousands of years, this piece of natural chaos sat untouched and dormant until whitewater kayakers deemed it was suitable to be run. With a few hundred feet of intense gradient, big bounces, and an almost complete whiteout of Class V adrenaline, we were dumped right into the salty Storfjord of the Atlantic Ocean. As if we hadn’t seen enough of Fjord Norway, we next found ourselves on top of Europe’s biggest vertical cliff, the “Troll Wall,” and driving down the famous Trollstigen highway to the final and most memorable part of our trip. The Rauma River is famous for its fishing, but like many rivers across the globe, overuse has brought on an illness. Mud snails from New Zealand have made their way through wet fishing gear all around the world and now are plaguing the Rauma, killing fish and many other native species. While the Lower Rauma is only a few kilometers long, it packs more punch than any river in the world. No drop is under 30 feet, and huge volumes of water endlessly crush whatever bedrock lies below. We had a possible record-setting high-water descent. Joined by local Norwegian legend Flemming Schmidt, we fought our way downstream drop by drop until we reached the final rapid, known as the father of all Norway waterfalls, “Flemmingfossen,” after the legend Mr. Schmidt himself. We sat staring at this monster of whitewater, and the maw of exploding terror gazed right back at us. This moment was half the reason I’d decided to make the journey to Norway, so I didn’t waste too much time, knowing that to dally allows fear to creep its way into my brain. 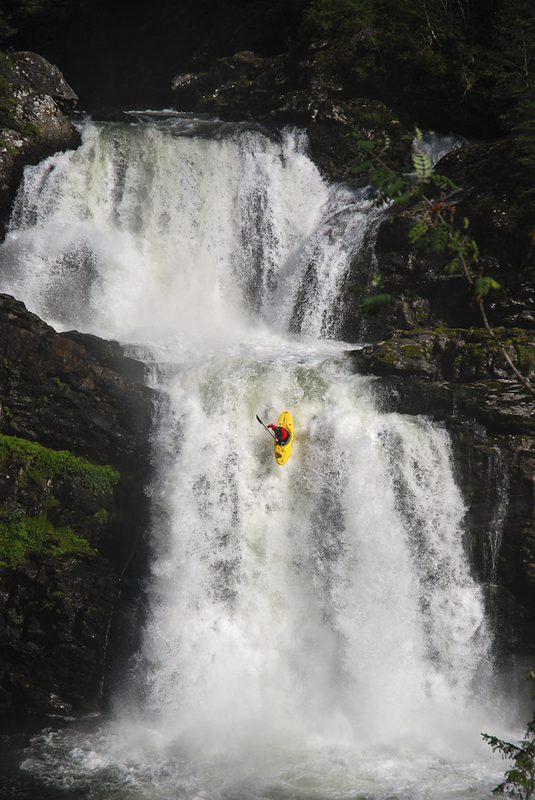 The simple act of deciding to run a rapid like Flemmings Falls means you have decided to risk your life. In moments like these, the whole world boils down to a single thought: All you know is that you have a line, and you have to stick your line! On this day the group had very wild but successful lines down the 60ft+ Flemming’s Drop. We walked away with our heads held high, but truly humbled by the power and demand of the river. Before we went back home to our responsibilities and lives, we decided to return to the Rauma for one last taste. 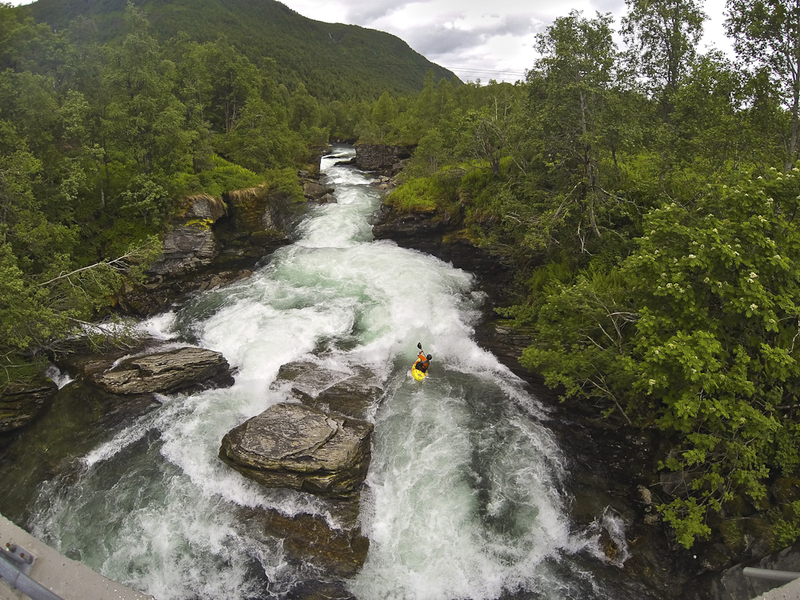 We had an incredible day of descending my new-found favorite river in Norway, until we reached the last drop, where the reality of such serious whitewater was brought home. Our good friend Matt Cooke from Whales ran the waterfall, was knocked off his line, and landed flat on a rock ledge after 50ft+ of free fall. Immediately, everyone knew this was a worst-case scenario. 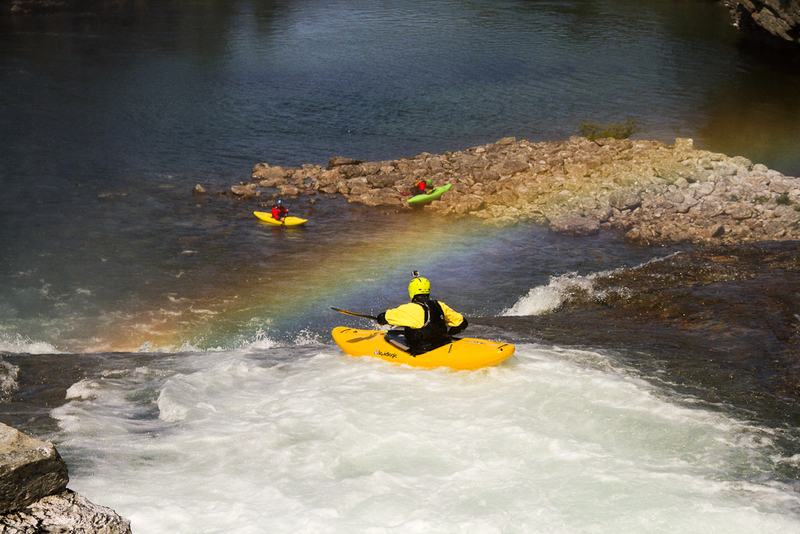 Matt was out of his kayak, half unconscious, and floating in the torrent of water completely helpless. Quick actions and a big recovery pool allowed us to get him to shore and assess the situation. It wasn’t good…Matt had broken his back. Being locked deep in a canyon with a severely broken back is about as bad as it can get in our world. We knew Matt had very little time until he became hypothermic and needed hospitalization, so we had to move quickly. We laid him in the ice-cold river, where your body floats weightless, relieving the pressure from the fractured spine. Having to make our way downstream and around one last serious rapid, we carried Matt and floated him as quickly as possible. Once we got him to a safe position, we called in a heli-evacuation and watched as our friend was loaded and taken away by a team of medics. Matt had severely fractured several vertebrae and needed immediate surgery to stabilize his spine. Thanks to the actions of the team and medics, he flew home to Whales to heal and will make a full recovery. Everything on this trip, whether it was the people I met, the places I saw, the rainy nights of sleeping with no tent, the meager portions of dinner served from a jet boil, the unearthly vibe from this corner of the world, made Fjord Norway one of the most spectacular and powerful places I’ve ever traveled. The lesson learned that day on the Rauma was that no matter who you are, and how comfortable you may feel in wild and exposed places, we are not made of metal. Intuition is a difficult, strange, and powerful sense that can save your life…looking back on that day, most of the crew knew there was just something not quite right about the moment. The level of the river, the look of the mist exploding at the base of the falls, the timing. The biggest lessons of life are often learned in devastating ways. These lessons stay with you, and the more I travel and experience the more I learn to stop, take a second, and understand exactly why I’m here.